Stainless steel door frame. Liner: GLASBORD ARMORTUF® woven fibreglass reinforced polyester, filling: polyurethane foam. Thickness - 120 mm. Reinforced PVC frame. Double seal, heating cable in door frame and sill. 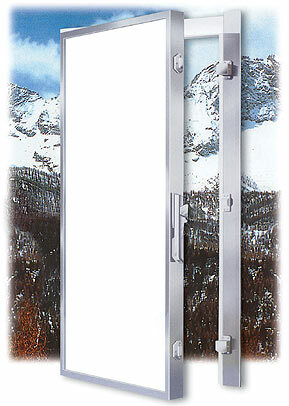 Standard stainless steel and composite lift off adjustable hinges. Door with lock, safe exit and lock cylinder.